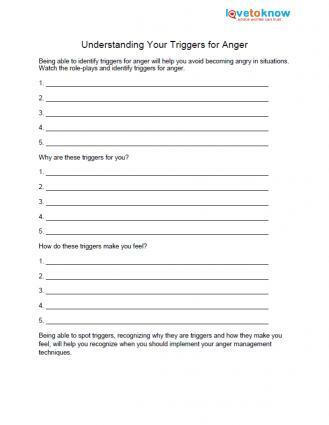 Whether you are looking for tools to help you manage your own feelings of anger or if you are putting together information to use in a class or coaching session, worksheets specific to the topic can be very helpful. 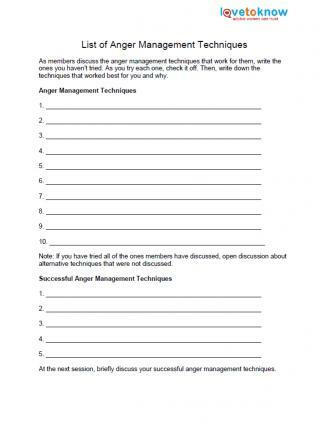 Use this series of seven anger management worksheets to download, save and print. Choose the documents that best meet your needs. If you need help downloading the worksheets, check out these helpful tips. It's important to develop - and use - a variety of different approaches to learn how to manage anger effectively. This worksheet offers a central place to brainstorm ideas for handling emotions. Learning how to express anger constructively is an essential skill. 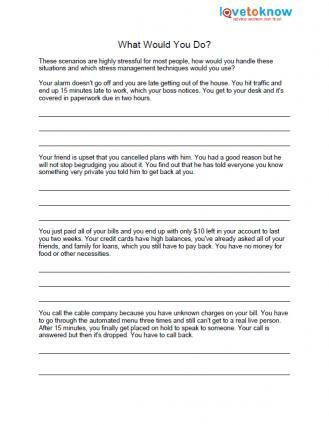 This worksheet helps you practice your communication. It's also helpful to look at hypothetical situations and come up with appropriate reactions. Practicing scenarios can help you keep healthy responses in mind in real life. During times of high emotion, it can be beneficial to take a time out and reflect on what took place. This worksheet helps you take a moment to decide what should happen next, rather than simply reacting with anger. 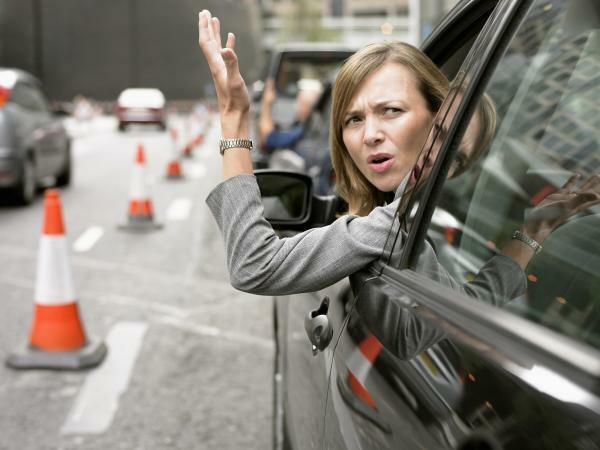 Knowing how anger can impact health can be a powerful motivator. 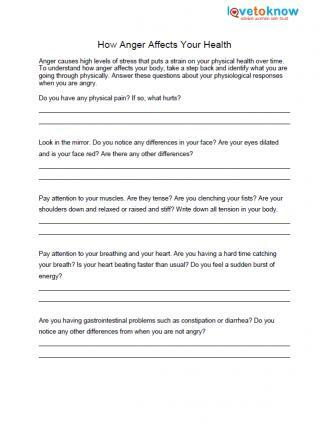 This worksheet helps you examine the effect of your emotions on your body. Honesty: It is critical to be completely honest when recording your anger. Do not use the worksheet to avoid painful thoughts or make excuses for your behavior - instead, use it as an opportunity to express your anger on paper rather than taking out your rage on those around you. Regular use: Using a worksheet once will not make it a valuable tool for an anger management problem. 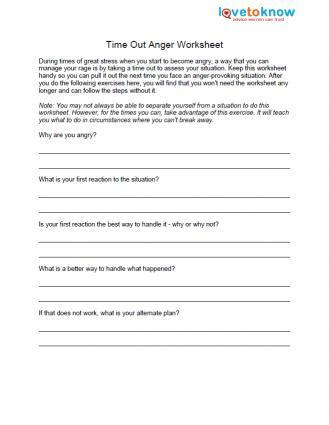 Use the worksheets whenever necessary to help you control your anger. Review: Look back over past worksheets regularly so you can see what progress you have made. If you have not made progress, you will be able to tell what methods are ineffective for your anger management. If reviewing your sheets is uncomfortable, ask a trusted friend, family member, or counselor to help you review them periodically. Additional tools: While worksheets are a great tool, they will be even more effective when used in conjunction with other anger management techniques. Consider adding deep breathing, meditation, and quick stress relievers to your arsenal of anger management. 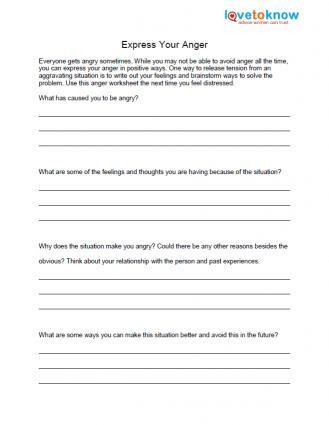 Free anger worksheets can help you manage your anger by providing the tools to monitor and evaluate your emotions. Used properly, worksheets can be one way to help you - or someone you are trying to help - avoid being controlled by emotions. 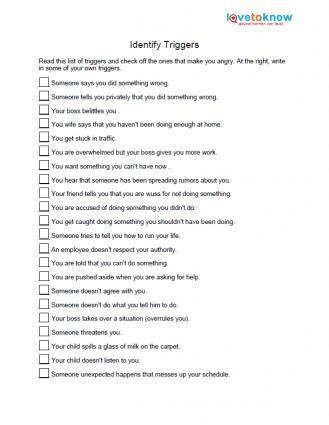 While these worksheets can be quite helpful, they should not, of course, be used as a substitute for seeking assistance from a licensed mental health professional.